The Bishops: "We must all move from simple tolerance to true respect for others"
The Bishop of Esmeraldas is alarmed by the situation of young people:"Violence is the fruit of the tree of injustice"
Pan Amazonian Network: "Cardinal Barreto, bearer of hope for the Amazon"
Quito (Agenzia Fides) - "In this moment of sorrow and deep concern, we join in a heartfelt prayer for the eternal rest of our brothers Javier Ortega, Paul Rivas and Efraín Segarra, abducted and violently murdered, while we express our closeness and solidarity with their families for such irreparable human losses, as well as to all journalists who risk their lives to make us know the truth of the facts". This is how the statement of the Ecuadorian Episcopal Conference begins, after the confirmation of the death of the journalistic team of "El Comercio" on behalf of the President of Ecuador, Lenin Moreno. 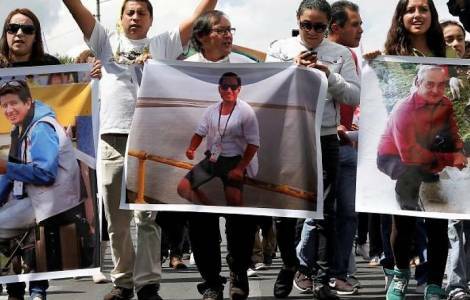 The two journalists together with the driver were kidnapped on 26 March by dissidents of the Revolutionary Armed Forces of Colombia (FARC), after crossing a military checkpoint in the province of Esmeraldas, in northern Ecuador, on the border with southern Colombia. The FARC signed a peace agreement with the government of Bogotá in 2016 (see Fides 23/11/2016 and 29/12/2016). In their statement sent to Agenzia Fides, the Bishops call on the governments of Ecuador and Colombia to work on the creation and consolidation of "more dignified, more fraternal and fair living conditions, particularly in the border area, developing sources of work and social assistance policies, and strengthening security systems". The Bishops urge the armed political and social groups "to put aside the use of force in order to overcome injustices and to adhere to the initiatives of dialogue and respect to build a genuine democracy free of all forms of corruption and violence". They then invite all those who make money by using inhuman and illicit means, such as terrorism, kidnapping, blackmail and murder, "not to submit to economic interests deriving from human trafficking and the production and trafficking of arms and toxic-additive substances". In their message, the Bishops reaffirm their "firm commitment to continue working for a more peaceful, just and supportive society", because they are aware of the situation that is going through the country, "such as the weakness of institutional structures, economic crisis and corruption", which have generated anxiety and confusion among the population: so the Bishops feel called to walk alongside people" encouraging faith and hope". "We are aware of the social, political and legal crises that affect and destabilize Christian families", continue the Bishops and say that in the coming years they will develop the "Mission Families".